The G Series is the most basic and cost-effective model that Bowman offers. It is a robust system with no moving parts. It has a bottom-up measurement geometry, which makes it different from all other Bowman Series. Samples are placed onto a clear window and positioned using the live video camera image. The sample stage can be manually adjusted to focus the camera on the exact area to be measured. The chamber is relatively small when compared to other models like the B Series. The small chamber and footprint can be well suited for jewelry and other precious metal analysis applications. The standard configuration includes a single fixed collimator and a fixed focus camera. The solid-state PIN detector is included along with our long-life micro-focus x-ray tube. 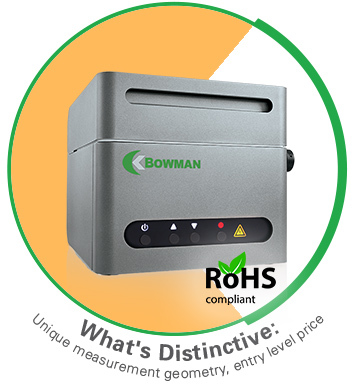 As with all Bowman models, the components can be upgraded to include multiple collimators, variable focal camera, or SDD detector.